During the aging process, every cell in the body produces energy to keep you healthy. The energy each cell produces is in the form of a molecule called ATP, which is made in the energy powerhouse of the cell known as the mitochondria. Ubiquinol has been shown to promote ATP production in the mitochondrial inner membrane. Ubiquinol not only helps to support your body’s energy production, but it’s also considered one of the strongest antioxidants. It has the ability to protect your body's cells from damage caused by oxidative stress and free radicals. Ubiquinol neutralizes the oxidant attack, and allows your body to repair and restore health. Many studies of heart patients health of patients suffering from heart disease have shown a marked decrease in the tissue CoQ10 concentration. Lower COQ10 ubiquinol concentrations and subsequent decreases in energy production in the heart muscle tissue, patients suffered more severe types of heart disease than patients with higher levels of CoQ10. One Clinical trial of patients with a severe form of heart disease called congestive heart failure were given 580 mg per day of ubiquinone. These patients found significant increases in blood levels of CoQ10 levels, along with excellent improvements in the ejection fraction of the heart (the heart’s ability to move blood) and improvement of the left ventricle, the part of the heart that sends blood out to the body. COQ10 has shown to be helpful in cardiac arrhythmias, a type of heart issue where the heartbeat can become too fast or erratic. Statin medications block the production of COQ10, so anyone who takes a statin drug, even the natural version red yeast rice, should supplement with 100-300mg of ubiquinol. Double-blind clinic research studies report that supplementation with CoQ10 can help significantly decrease blood pressure. COQ10 has also been shown to help people with various forms of gum disease. Ubiquinol (from the word ubiquitous, meaning "everywhere") is a molecule that plays an important energy and antioxidant role in every cell in our body. 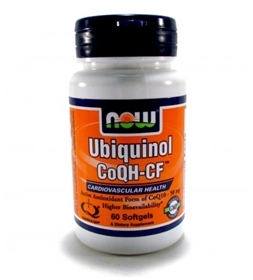 It's benefits for heart health and gum disease are undeniable, especially the highly bioactive form of COQ10, ubiquinol.